David Round is a sixth generation South Islander who teaches law at the University of Canterbury. He is the author of Truth or Treaty? Commonsense Questions about the Treaty of Waitangi (Canterbury University Press, 1998) and a contributor to Twisting the Treaty, A Tribal Grab for Wealth and Power (Tross Publishing, 2013). He is currently the chair of the Independent Constitutional Review Panel. 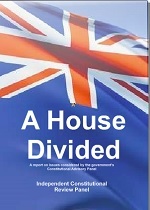 A House Divided is the report of the Independent Constitutional Review Panel. Members of the Independent Constitutional Review Panel are Chairman David Round of Canterbury University, with Professors Elizabeth Rata of Auckland University, Jim Allan of the University of Queensland, and Martin Devlin of Massey University, NZCPR Research Associate Mike Butler, and NZCPR Director and Panel Convenor, Dr Muriel Newman. Please note that some published hard copies of this report are available and on request – HERE – can be posted out (we would appreciate it if you could provide a donation to cover all costs).